Weekend in Paris! What?! Congratulations! You are luckier than many other people for having the entire weekend to hang out in Paris. Paris, as we all know, is the city of light, the city of history, art and fine cuisine – the capital of culture and beauty. To fully describe the list of thing-to-do in Paris, the list must consist of 100 items. Yet we understand that you only have 2 precious days, so we have come up with a list of the most special for you to spend the most out of your weekend in Paris. Needless to say, this is the first and compulsory destination that you have to prioritize first! This is the heart of human kind cultural peak, this is where you get to oversee the history of humans via the richness of culture. This is not only a huge hall of fame to celebrate creativity, beauty, art, science, intelligence and kindness but also a place for you to learn a lively lessons of human kind development so that you will be more motivated and grateful for being a human being of later time. Eventually, we may all end up getting jealous of our children, since they will get to see more human great artworks, just like our previous generations got jealous of us a long time ago. Anyhow, prioritize this magnificent museum first. Bragging about its size, prizes and famous artworks that the Louvre owning only deteriorates your curiosity as well as the museum’s best kept secrets, so we will save it for later and let you enjoy the Great Louvre on your own. Line is long, so you should buy tickets online to save your precious time. Do not buy “Skip the Line” ticket. It is a huge disappointment! The Louvre opens every day (except Tuesday) from 9 a.m. to 6 p.m. Night opening until 9:45 p.m. on Wednesdays and Fridays. Tours of the Louvre are given by national museum guides. An 90-minute tour to discover the museum’s collections, whether it is your first visit or you are a regular museum-goer. The introductory tour is the best option for a first visit since it gives you an overview of the museum’s most famous works. It is available in English. Group visits must be booked in advance. Check the reservation schedule. May is a good time with fewer masses of bodies. May 1st, however, is the day when the museum closes. Take the expense and buy a book, your own photographs won’t be as good. The museum is so vast that you can get lost.The best time to go is on the nights that they are open in the evening until 9:45. The crowd is significant less. You can get up to the front of the crowd to see the Mona Lisa easily, leaving you plenty of time to explore the rest of the museum. If you don’t mind waiting in the line, we guarantee the view is worth it. It is one-of-a-life-time experience and photos don’t do its justice. Book a table to have lunch on 2nd floor, dessert is awesome and waiters really wait on you. Dinner on 52nd floor is even better, food is awesome. Eiffel looks glossy at night. By the way, Paris doesn’t have a lot of tall buildings, so the view is even more romantic. It is a must if it’s your first time to Paris. Hire a segway or take a segway tour around Paris downtown. Stunning, gorgeous, inspirational, breath-taking, can’t put it to words are compliments for Notre Dame Cathedral. Setting your foot inside the cathedral, you will be blown away by its architecture and details. You can read and study as much as you want in school about medieval architecture and buildings, but you will never experience such feeling when you actually step inside and get your feet swept off by the painstaking gorgeous ceiling painting. The more time you spend watching and studying the building of art, the more admiration you will have for humans because apparently they did not have machines, robots and computers to help them build such a marvelous construction. This river a must-see spot in Paris. It has open and fantastic view, we highly recommend you to take the river bus boat to fully enjoy every inch of the Seine. 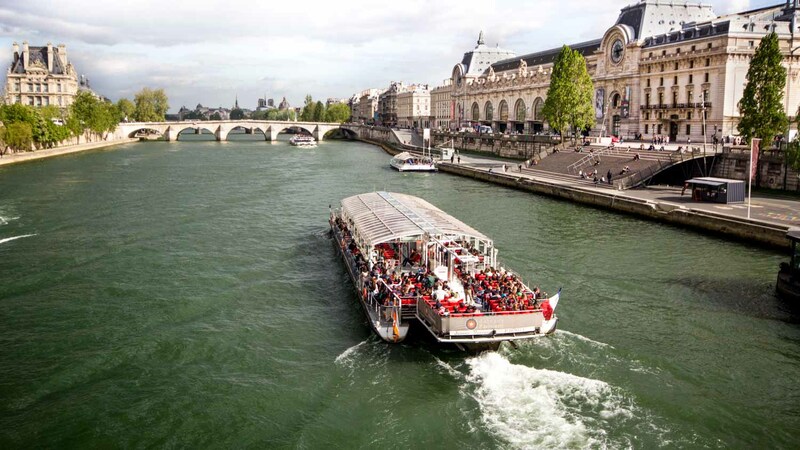 It is not only the best way to see the Seine, Paris on the riversides and many lovely hidden spots but also the least expensive way to discover the city. Boat cruise at night is even more romantic and peaceful. Locals find this is a great place to relax and have lunch. The river is indeed a romantic place for couples to kiss, adore and relax together. So we suggest that you should take your spouse/girlfriend here to spice up your romance. No wonder people call Paris “city of Love”. Love, love and love more while you live. Cuisine is a huge and serious thing with French, especially Parisian. You probably won’t have enough time to enjoy a full French lunch which lasts for several hours. Thus, we suggest you take a break from your tour, sit back and relax once in a while at any Parisian cafe in Paris. World-class authentic French pastries, sweets and desserts await you at those Sweets Heavens.